This is a compass Michelangelo used while working on the Sistine ceiling. 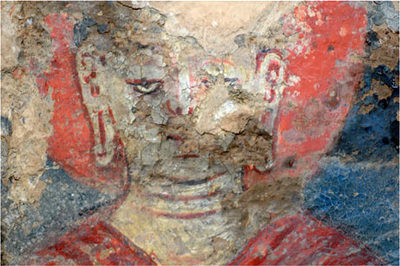 It's part of a "Vatican Splendors" exhibit bound for Minneapolis. 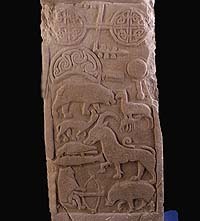 The [Pictish stones of St. Vigeans], which date back to the decades before the nation of Scotland was born in the 9th century, depict ornate Christian crosses and fantastic beasts and bear both Latin and Pictish writing (the latter now indecipherable). . . . The stones are a great early Christian treasure of Angus. 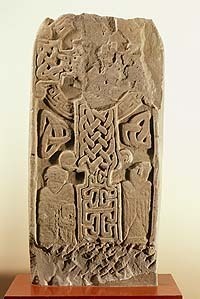 They include the Drosten Stone, a cross slab with ornate cross and fantastic beasts, plus a rare Latin and Pictish inscription which might have commemorated King Uoret who died around 842AD. In 843AD, the Pictish kingdom was united with Gaelic Dalriada under a single monarch – leading to the birth of Scotland. Read more about the Picts here. 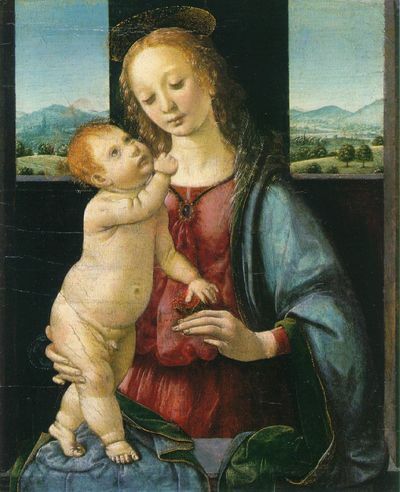 This stunning illustration comes from a manuscript on display at the British Museum. 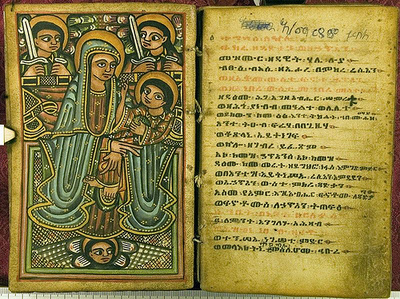 It was "commissioned in the last years of the 17th century by Emperor Iyasu I Yohannes of Ethiopia for use in his royal city of Gondar." 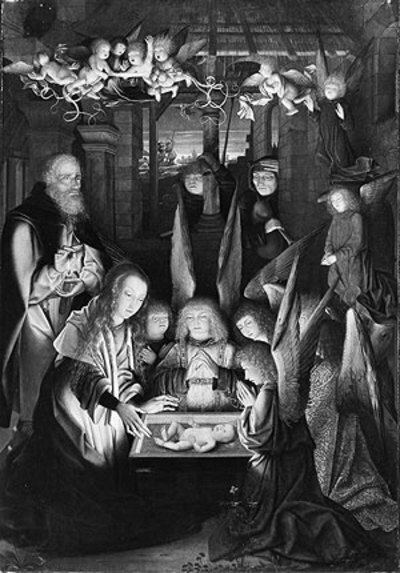 Note the symbols of the apostles surrounding the enthroned Christ: Matthew the Man, John the Eagle, Luke the Ox, and Mark the Lion. 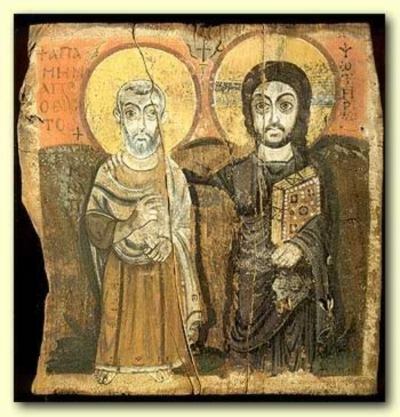 I find it interesting how the compressed bodies, large-eyed faces, and stylized positioning reflect the Coptic (Egyptian) style, but do it in such a distinctive manner. 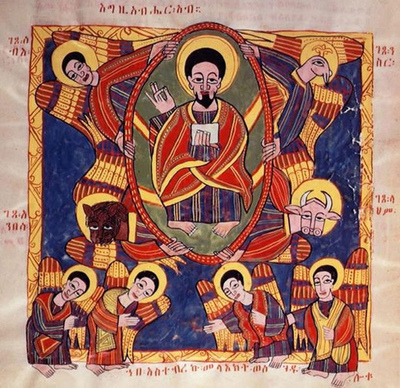 Here's another Ethiopian illustration, this one found in an early twentieth-century psalter, which highlights the compressed figures, the enormous eyes, and the stylized positioning.